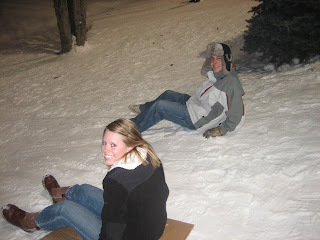 We decided that we wanted to go sledding, plus I had never done it before so I was really all for it. 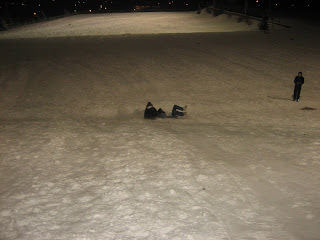 Reed, Cameron, my roommate Andrea and her cousin and me decided to go sledding up at the upper playing fields. I called Aaron and Kevin to come play with us so they did. 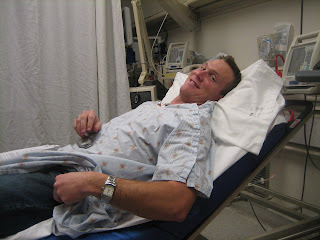 The night ended really exciting when Kevin decided to snowboard on the sled and knocked himself out and going to the hospital to see if he had a concusion. He got lucky and was concusion free. Cameron and Me were racing. We kind of collided at the bottom. Oh Kevin...You know how to make the night more interesting! 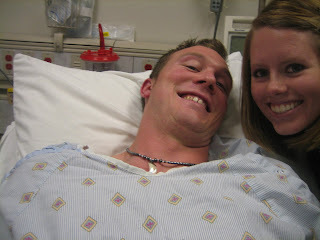 What would life be without a trip to the hospital for getting a concusion from sledding!